Mary Hempen, R.N. 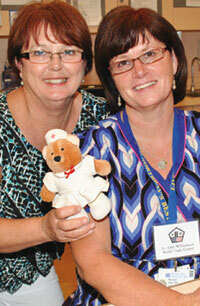 (left) and Maureen Allain, R.N., have enjoyed using Nightingale to keep the Nurse Camp alumni playing along. Where in the world is Nightingale Bear? That’s the ongoing question in the minds of NorthBay Healthcare’s 32 Nurse Camp graduates who completed a four-day session in June that spanned everything from surgery and emergency medicine to obstetrics, gynecology, labor and delivery. Nightingale Bear, you see, belongs to Mary Hempen, R.N., one of the camp’s cofounders. She decided to bring her little stuffed friend to camp this year, and games ensued. The winner got to baby-sit Nightingale during camp, and a select few got to take her home for a night. Once a month, Nightingale is photographed at some location inside NorthBay Medical Center in Fairfield or NorthBay VacaValley Hospital in Vacaville and the image is posted on Facebook, on a special page created for the alumni of Nurse Camp. The first student to respond with the correct location wins that round. Nida Baig was the first winner for July; she took home some NorthBay “swag,” a notebook cover with the NorthBay Logo. “It’s a way to keep the kids engaged, and have some fun,” says Donna. The camp, in its eighth year, was again a tremendous success. More than 80 students from around the county and beyond applied. “We only have a limited amount of resources, so we could only take 32 this year,” explained Maureen Allain, R.N., and camp cofounder. During the four-day course, students get a chance to meet nurses, experience a mock drill in the emergency department, experiment with some of the equipment and see a simulated patient (a mannequin) deliver twins. “It’s wild, it’s fun, and it really helps kids who think they’re interested decide whether this is the career for them. Not only that, but it’s a lot of fun for us, too. It reminds us how important nursing really is and how passionate we are about it,” says Maureen.